One million Naked bottles and counting - this spirited couple know what Angels want! Boy (Adrian) meets Girl (Rebecca) are are on the ride of their lives raising their family while living and breathing their other passion - wine! The pair have been involved in winemaking for over 15 years. You can always expect their range of Naked exclusive wines to include something a little left of field. For years, their dream was to one day make their own wine. Fast forward to the present and they're finally living that dream with thanks to the backing of Naked Angels. Their wine is dedicated to their family, and of course any Angel who has helped make their wine possible! In just 4 high paced years, the couple have gone from producing a handful of Pinot Noir cases to quenching the thirst of 1000's of people around the country. 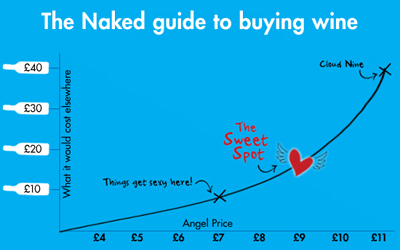 In 2016 they clocked up their 1 millionth bottle sale through Naked - yes, 1 million! As one of the very first teams to hop aboard the Naked train, Adrian and Rebecca continue to amaze, inspire and often fill our glasses here at Naked HQ! Just sold her two millionth bottle exclusively to Naked customers, crafted at one of Victoria's most renowned family vineyards. With the help of funding from Naked Wines, Jen is making wines the way she wants. This is a huge win for all involved, since Jen was voted Australia's Young Winemaker of the Year in 2009! One of Jen's favourite things about being a Naked winemaker is chatting with you, the people who drink her wines. So go ahead! Ask her anything. Before she made wines for Naked, Jen earned her family's winery a 5 Star rating from James Halliday and her meticulous approach ensures she will bring the very best out of all the grapes that she works with. Wine is my hobby as well as my job. There is a special satisfaction working with wine - it is alive! Sourcing grapes from fruit grown on the family vineyard in the Strathbogie ranges of Central Victoria. Winemakers don't come much more in love with their job than Sam who would "happily spend everyday around tanks, barrels, stainless steel toys and wine"
A self taught winemaker, a multi award winning winemaker under Plunkett Fowles and currently studying his 'master of wine'. The Angel funding has accelerated the start-up of Wine by Sam and has helped pave the way for Sam to continue making the great wine he loves to make exclusively for you! Adam Barton began as a winemaker largely as a result of tasting a glass of the 1965 Lindemans Hunter River Burgundy which he described as "magic". Based in the Clare Valley, Adam has the freedom to explore different variteals and keep pushing the boundaries of experimentation to the delight of Angels' taste buds everywhere. Winemaking since 2001, the reason Adam's wines are so special is due to carefully selected vineyards, passionate grower partners & lots of care and attention to the smallest detail in the winery. Adam's Rabbit & Spaghetti range of Red wines are consistently loved by Angels, garnering a mammoth 90% or more buy-again rating year in, year out! Angel funded Aussie winemaker with bags of raw talent...and access to some of the very best grapes! Coming from a wheat and sheep property in the Great Southern region of Western Australia, Liz wanted to do something agriculture related & has now been a qualified winemaker since 2004. Liz's wines are made with attention to detail, passion and commitment. Liz tried to source the best fruit from the best vineyards to make a wine that is interesting and different whilst something everyone can still enjoy. After spending a year in Italy studying for her Masters, Liz fell in love with the lifestyle and the wines & draws a lot of passion from this time. Growing up in the beachside suburbs of Perth, Rory Clifton-Parks developed an early love of the salt, sand and sun that his coastal surroundings enveloped him in. Rory has been winemaking for 15 years now, having first started working for Evans and Tate and Boar's Rock in Western Australia. Rory strives to make high quality wines which reflect the terroir of the region. With some of the best facilites Margaret River has to offer, Rory gets great satisfaction from seeing fruit processed through to the final bottled product. Making exceptional McLaren Vale wines is Hamish's passion. Having spent over 15 years winemaking both here and abroad, he is delighted to now be able to share his experience and passion with Angels everywhere. In between catching a wave and crafting wines for his Shottesbrooke label, Hamish spends his time thinking outside the square and dreaming up new and innovative blends that truly speak of their origin, exclusively for Naked. The reason Hamish's wines are so special? "They're from McLaren Vale… the grapes do most of the work themselves. Happy vines, happy wines..."
Both Anna and Derek are super experienced having made wine in Bordeaux and Rhone just to name a couple, before landing in the same place... Mount Benson on the Limestone Coast. Anna and Derek are really passionate about where they live. Their house is situated on top of Woakwine Range overlooking the townships of Robe, Cape Jaffa and Kingston. When vintage isn't so manic, they love listening to chill-out music in the cellar, comparing notes about the surf over the weekend and having a well earned beer at the end of a hard day's work! Their wines are expressive of their region, and serious wines are what they specialise in (full bodied reds made in a cool climate style). 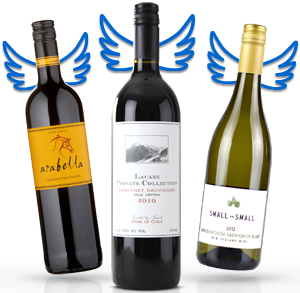 Whilst the 'Obelisk' range is exclusive to the Naked Angels some other wines in their stable have already been declared Outstanding by James Halliday... they are definitely a couple to look out for. Brian, from the Margaret River in WA has been producing for 30 years now and once managed a winery in Tunisia, Italy working out of an old colonial French Chateau making Carignan. Brian Fletcher works with exceptional and dedicated growers in Margaret River so has access to fantastic fruit and a wonderful region in Margaret River to work with. The upfront funding from the Naked Angels provides a fantastic opportunity for Brian to innovate without a total financial exposure. Brian cannot wait for the day he can talk directly to the angels and together they can create a new wine from scratch. Geoff loves everything about wine... the vineyards, the winemaking process, the people and food & wine together. Wine is Geoff's passion, it's his creative science and it all starts in the vineyard! He has been a winemaker for 14 years, working for others which allowed Geoff to fine tune his craft but now is the time for him to be able to drive his own wine styles and offer them to Angels. It's no secret that Shiraz is Geoff's favourite varietal but he is always chasing varietal definition and balance in all of his wines. The key for him is to provide the value proposition at all price points.